A flexible soft case, personalised by you and for you. Design the cover with one of your favourite photos. Choose a Black, White or Transparent base colour for your soft case. Ensure your Samsung Galaxy S5 is in good hands with one of our personalised soft cases. The soft case is a highly durable, highly flexible case that is great at absorbing bumps. Your phone will be will protected against scratches and dents. In addition, you can design the entire back of the soft case as you please. Your design will be printed on the entire back of the case and the sides will remain in your chosen base colour: Black or white. Our design module makes the wholde design process quick and easy! Your design on the entire back of the case. Use a picture of your pets, honeymoon, children or friends. Make a collage of everyone and everything that means the most to you and make the perfect, personalised photo phone case. Rather have a less private design? No problem. Design the case however you please. If you dont have any inspiration right not, check out our Pinterest page for ideas. 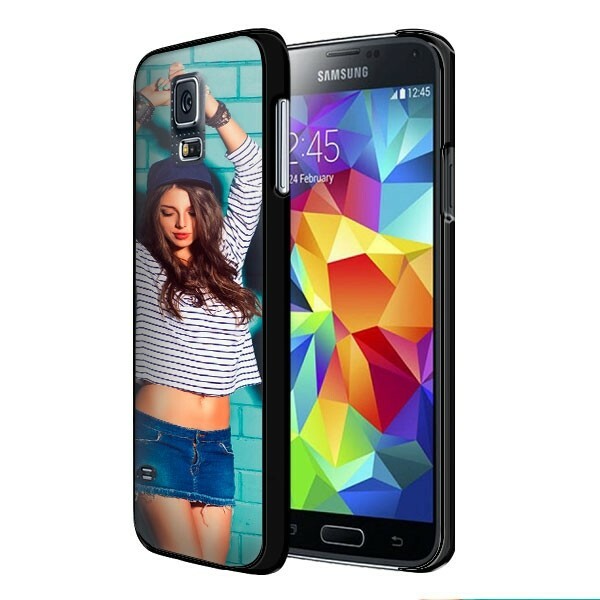 Make your own Samsung Galaxy S5 soft case using our design module in a matter of minutes. Enjoy! If you ordered your case before 17:00, it will be made and sent the same day! We try our best to have your case delivered as soon as possible. Our average delivery time is 5-7 days. Get started now and have your case within a week!